Hello to all. 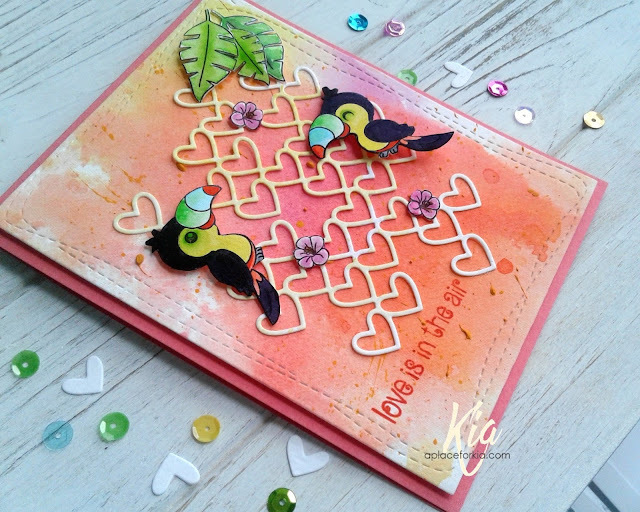 Kia here with you today to share this card I did for Team Tuesday called Love is in the Air. I love birds and have a Cockatiel named CC. They are quite the characters which I tried to incorporate into this card. I used my Mini Misti for this project, first stamping the images using Ranger Archival Ink in Jet Black. In the video I have done for this you will see that I stamped several of the leaves, moving my paper, not the stamps. I do this as I watercolour them differently and this way I can pick the best for my card. To paint the leaves and the birds I used Zig Clean Color Brushes. For the background, I did what is known as the smooshing technique using Tim Holtz Distress Inks in Lemonade, Picked Raspberry and Ripe Persimmon, spritzed with water. I did 3 layers of colour, drying with my heat gun in between each layer, then die cut using the wonky rectangles die. Once finished I flicked on acrylic paint in yellow to the panel. I did a mini smooshing to the stacked hearts using Lemonade spritzed with water and dragging the die through the wet ink. The panel is attached to the card base using foam tape. 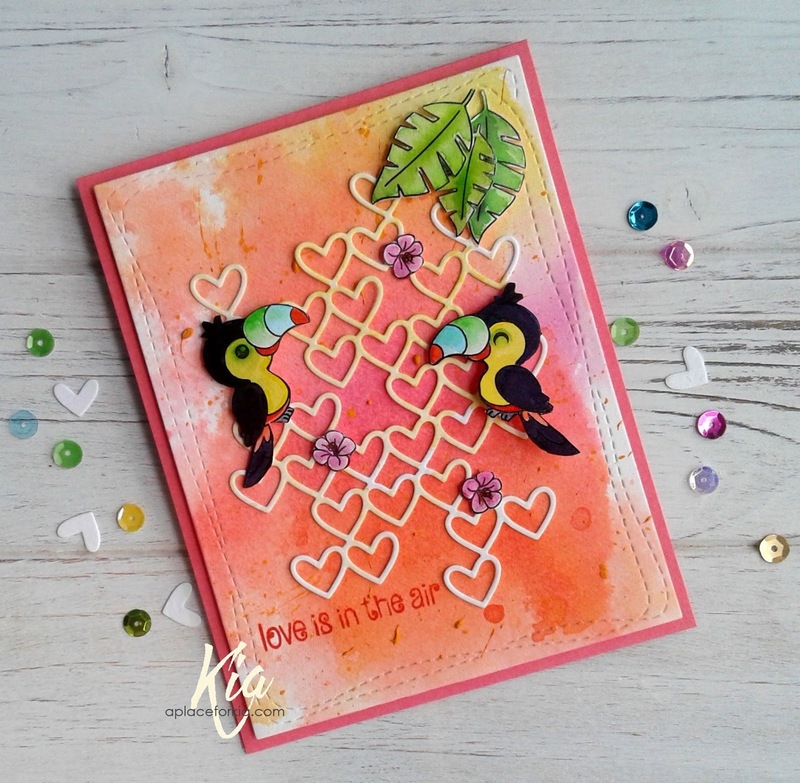 I glued on the stacked hearts, then styled and attached the birds and leaves adding in the flowers as if they were sequins. Here is a close-up to show more of the details. It was once I was done all of this that I remembered I did not stamp my sentiment. Misti to the rescue ... I put the card back in my Misti and did several passes with the ink, which is the Ripe Persimmon. As I am stamping on a hallow, the top of the t and h from "the" did not stamp well, so I touched that part up with my ripe persimmon distress marker. This video shows my process, I hope you enjoy it, and thank you for visiting My Sweet Petunia and Team Tuesday. Wonderful card. Love those birds. Your coloring is outstanding. Oh my ! This is such a wonderful card ! That blended background is so smooth with gorgeous colors. And these colorful birds are absolutely adorable !